- Mr Taco was on South Broadway where The Adult Bookstore (Risque’s) is now located. 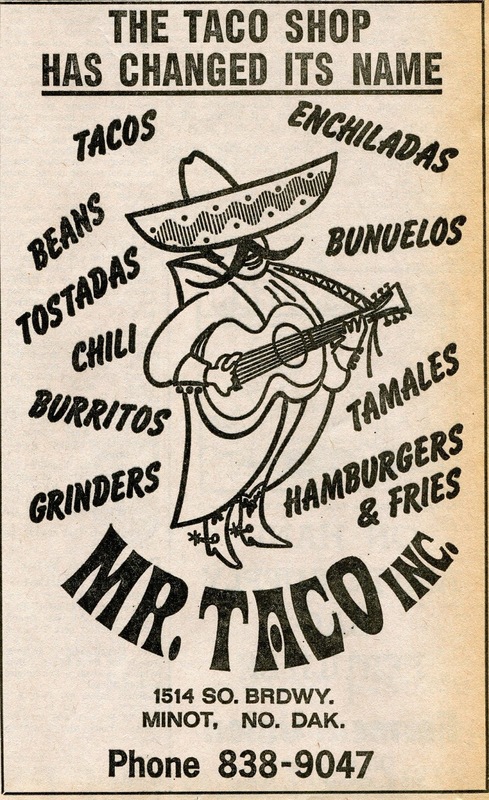 Mr. Taco was owned by Sam Butts or Taco Sam as many called him. I may be wrong, but I believe the Taco Shop had the first, only and best tacos in Minot at the time, in the late 60’s. Mr. Taco also was the first shop to sell Grinders... Similar to a sub sandwich. Next door to Mr. Taco's was another South Broadway “landmark”. Bennie’s Magic Mile Market or as many referred to it … the Bubble Up Store. Bennie’s was just one of many neighborhood grocery stores in Minot at one time. Bennie’s Store is now and oil change shop. I believe B&D Market in northeast Minot is an off spring of Bennie’s on South Broadway.